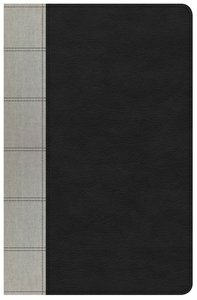 About "KJV Large Print Personal Size Reference Indexed Bible Black/Gray Deluxe"
The Large Print Personal Size Reference Bible features large, easy-to-read 12-point type in a convenient, easy-to-carry personal trim size that is perfect for devotional reading, personal study, or to carry and use at church. This edition is made with premium materials and bindings and packaged in a clam-shell gift box that is perfect for gift-giving. Features include: Deluxe cover materials, Smythe-sewn binding, High-quality Bible paper and end sheets, Clam-shell gift box, Two ribbon markers, Presentation and Family Records section, Two-column text, End-of-paragraph cross references, Topical subheadings, Words of Christ in red, 12-point type, Topical Concordance, Full-color maps, and more.